Cristina Rayne Fantasy and Paranormal Romance Author: Tempted by the Jaguar: The Complete Edition (#1 - 4) (Riverford Shifters) Now Available! 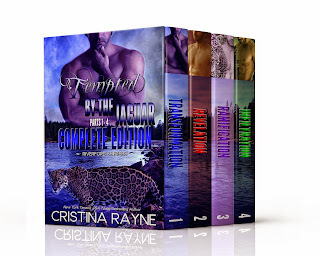 Tempted by the Jaguar: The Complete Edition (#1 - 4) (Riverford Shifters) Now Available! Now Kylie must decide whether to integrate more deeply into Hunter's jaguar clan in order to take advantage of this rare opportunity or to run while her secret still remains uncovered. To stay would mean deliberately putting herself in more danger than Kylie may be prepared to handle, especially when Hunter, the person she must rely on, may be hiding something as well.